Chthonian Highways is a tabletop role-playing game set in a world where nightmarish creatures have ravaged the Earth, and otherworldly landscapes have merged with ours. Strange, dreadful beings prowl in the shadows, and dangerous alien flora is taking over the green forests and grasslands. The few remnants of civilization are held together by the Chthonian highways – a web of roads that are still traversable by ground vehicles. The characters are dauntless road warriors who roam the cursed highways in their souped-up cars and motorcycles for as long as there is gasoline to keep the engines roaring. Chthonian Highways is currently at its beta stage. The existing layout and art are close to final in style, and quality and the rules are fully playable, but some parts of the content will be expanded or balanced in the future updates. This version of the game includes 80 pages of setting material, rules, character creation, equipment, vehicles, monsters and NPCs, and two ready-to-play scenarios. Any future updates, including the final product version, will be done to this product. Also, if you purchase the beta print-on-demand version, you will get a discount for the final print version. What we know now as the Reckoning started roughly twenty years ago. First, there were massive earthquakes like none we had ever seen before. The quakes were followed by tsunamis and the thick fog that rolled in from the sea. Millions of people were killed and lost in these natural disasters. At least we thought they were natural until the great sinkholes appeared and many cities collapsed into the deep chasms on the ground. Dense, foul-smelling steam poured out of these holes, and people reported that they saw horrific creatures climbing out of the thick mist. The earthquakes and the sinkholes of the Reckoning shattered most of the old roads and highways, but some were spared. The highways that are still good are used to transport people and goods through the wastelands between the settlements. While the cannibals and bandits often lie in wait along the roads, the roads are still safer and faster to travel than the badlands that are filled with unknown threats and abominable monstrosities. 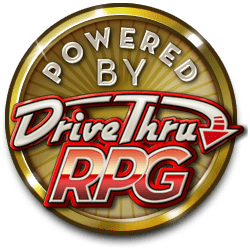 The player characters are road warriors, brave men, and women who are willing to risk their lives on the chthonian highways for a cause or worldly riches. Some road warriors are more like mercenaries or wasteland paladins on a quest, while others are more like traveling merchants or messengers trying to keep up people’s hopes. Because death is always lurking on the chthonian highways, road warriors tend to form groups called convoys. The road warrior convoys are tightly knit groups with people, who are willing to give their lives for each other. Only by trusting your convoy, you can survive another day on the chthonian highways. There will be a discount. Not sure how big as of yet, but we will give a discount to the beta POD purchasers. So I'm assuming this is the complete version? Some parts of the content, like the setting material, monsters, and character options will be expanded in future updates. In other words, this is a fully playable version, but not final. Este producto esta en nuestro catálogo desde January 17, 2019.